Ms. Z sitting in the sunlight on Cape Ann MA. Perfect light around Zoe and a lovely shadow coming from her as well. Ms. Z might be the most loved dog on the interwebs! Nice shot. Always difficult with that sun also playing a part but looks good. 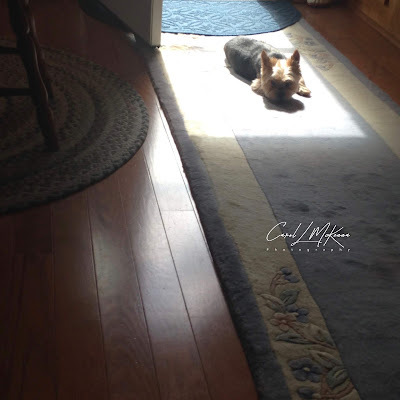 Animals like the warmth of the sunshine, perfect place for the dog. lovely photo and an ideal place to lie! It is a win/win. You get a shadow and Zoe gets a warm place to nap. She must enjoy sun puddles. She loves the sun puddles! Yes turn around three times before laying down. I've wondered about that myself. Ms. Zoe is a lovely shadow indeed. There's something so peaceful about this photo, even though much of it is in the dark. Maybe the peaceful part is Ms. Z! Our cats adore sun puddles too; they'll get up and move as the puddle advances across the room! Precious! PS- in response to your ? about leaving comments using Google on my blog- I have no clue what that's about-sorry.